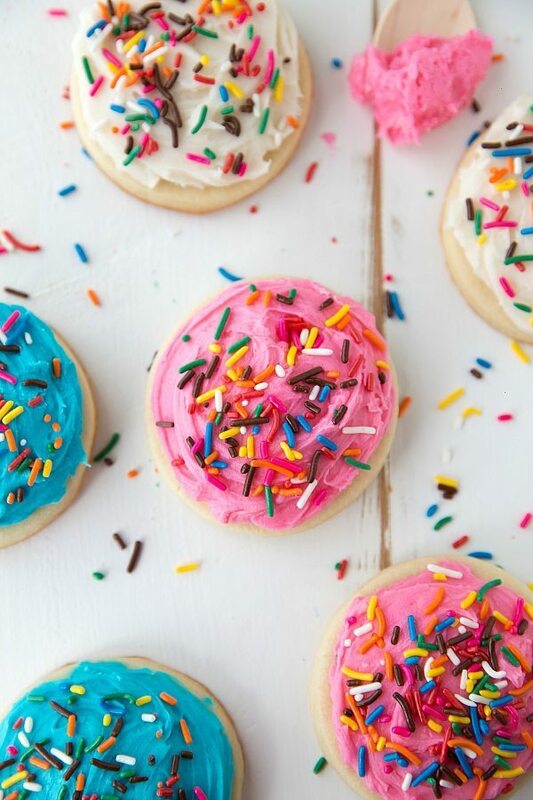 2 secret ingredients make up some of the best ever sugar (circle OR cut-out) cookies. 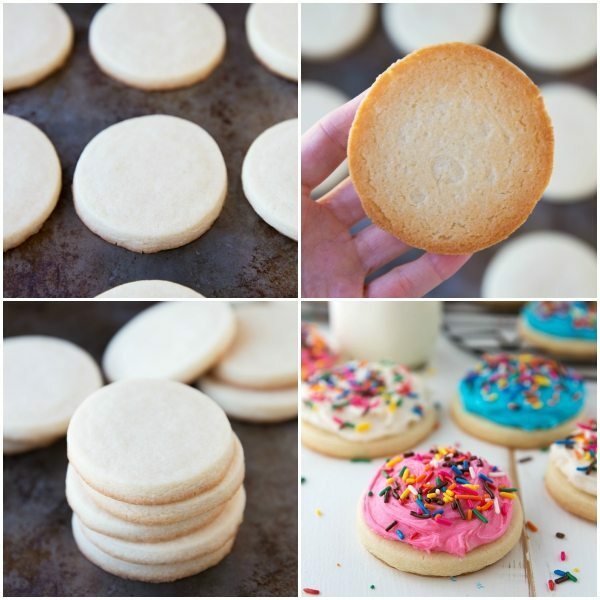 These Sugar Cookies don’t require any chilling and hold the shape of a cutter extremely well! Plus a delicious and creamy frosting recipe! I know what you are thinking. 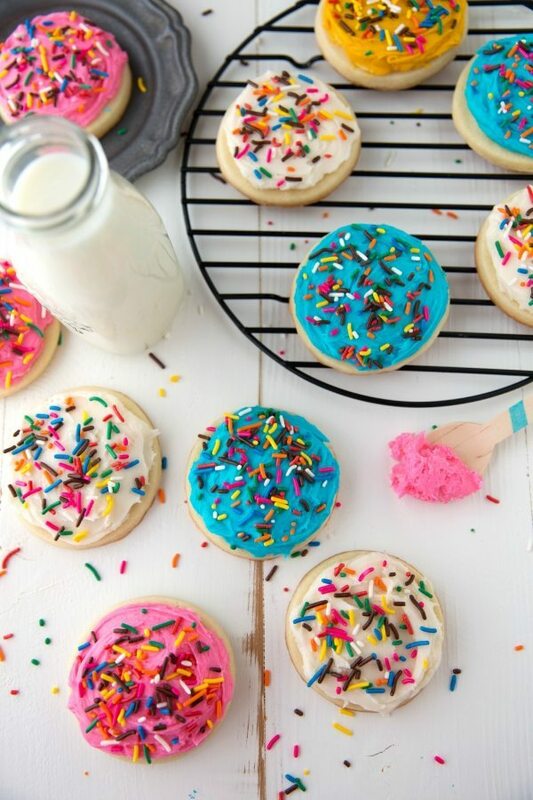 ANOTHER sugar cookie claiming to be the best sugar cookie ever. 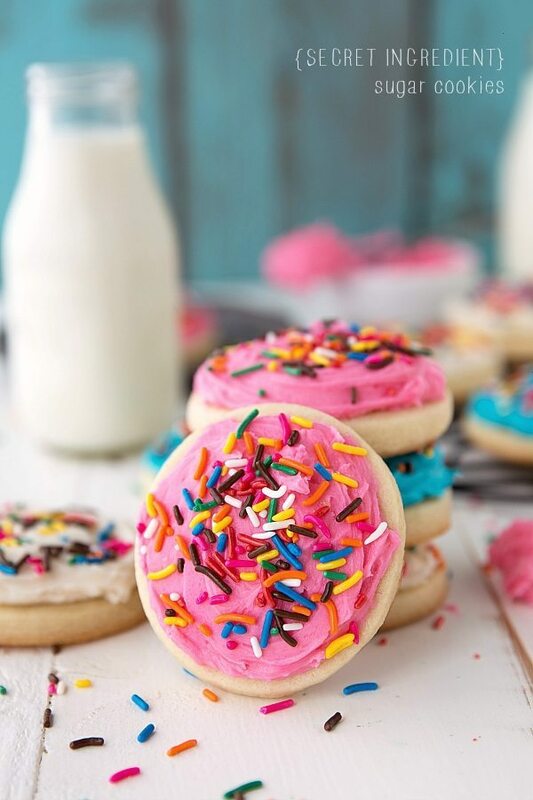 But really…these cookies have legitimately been years in the making. Two years to be precise and the results are completely worth it! There have been countless batches and dozens of changes and tons of taste testing done by many people. I’ve been determined to have the very best sugar cookies and refused to post the recipe until I was 100% satisfied. And well, the day has come! 🙂 But be warned — this post has a ridiculous amount of text. 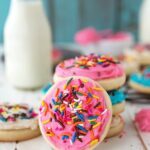 Over the past two years of experimenting, I have learned a lot and I want this post to be all inclusive so I leave you with the knowledge (and recipe of course) to create the best sugar cookies. A recipe is only so much — there is absolutely technique to baking these cookies and that’s what I’m sharing today. Here is a comprehensive list of exactly what I use in these cookies. First, sugar — I have a huge container of sugar that I store vanilla beans in. This really heightens the flavor of the sugar. Next, butter — I call for salted and recommend you stick to that as I don’t know how much salt you are going to want to add if you use unsalted. For sugar cookies you absolutely do not want to substitute any kind of margarine or butter knock-off. Not only will your cookies have an off taste, but they also will likely need to be chilled. Keeping this recipe no-chill is all about keeping the butter and cold as possible. There are also higher quality butters that will yield a creamier texture. I use and recommend Tillamook butter. Third, the egg. I am a huge proponent of organic eggs in baking. 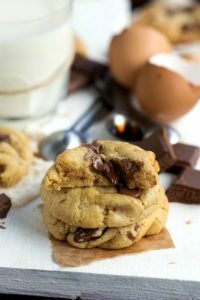 They heighten the flavors immensely and as I’ve tested these cookies with regular eggs versus organic – there is definitely a taste difference! If you ever compare the yolk and whites of a regular egg to an organic egg there is a very clear difference between the colors and textures. Regardless of what type of egg you use make sure it is a large one! Next are the extracts. If you read that these cookies have a couple of “secret ingredients” these extracts are one of those ingredients. It is amazing what adding extracts can do for these cookies! At first I just used regular vanilla. Changing to Mexican vanilla was immense for the flavor. The next one is almond extract – it , along with the pure orange extract add an incredible freshness to the dough and the final cookie. You will notice a huge difference by adding these two extracts. I used Nielsen-Massey extracts for these cookies. Adding the orange extract was on a whim one day and I won’t ever make these cookies without it 🙂 It adds some delicious fruity notes as well as freshness to these cookies. For these cookies it’s pretty crucial you have a stand mixer. They work out the very best when done in a stand mixer and will be a bit more of a challenge without one. That said, hand mixers will work, you just need to be a bit more patient. You may also have to chill the dough for a little bit if the butter gets too soft from working with it. The method isn’t anything too revolutional, but I have learned a few ways to make these better over the years. First, cubing the butter is really important. I unwrap the butter and cube it on the paper. I dump the butter into the stand mixer without even touching the butter. Avoid touching it to keep it as cold as possible. Next, I beat the butter and sugar until completely creamy. You want the butter and sugar very well incorporated before adding any other ingredients. After that, I beat again with the egg and extracts added. Finally, I add in the cornstarch and baking powder with 1 cup of flour. I beat that all together. Once all those ingredients are added, I add in another cup of flour. Here’s where it starts to look like crumbles. DON’T WORRY! The batter comes together, you just need to be patient and keep beating. Once it starts to look like dough again, add in the last bit of flour. I start with 3/4 a cup and usually end up adding another 1/4 cup to make 3 cups total. I say keep mixing when the dough is crumbly, but only mix until a dough that you can cut out cookies is formed. Over-mixing the dough will lead to tough cookies as the gluten from the flour starts to develop. The exact flour amount depends a lot on how you measure it. Some people press their cups into the flour packing in way more than is needed. Others loosely measure and don’t fill up the cup all the way. I spoon and level the flour – a looser measurement and right to the top leveling off anything that goes over the cup. Add the last cup slowly to ensure you don’t add too much flour. And you know you haven’t added enough when it is too wet to work with. With hand mixers, you are going to need to really work this dough. It gets really crumbly, but that’s normal. If you continue to beat it (and even knead it a bit with your hands) it will come together. Okay so baking these cookies. I like to have the oven preheated about 20 minutes before I even put in a batch. This ensures the oven is really at the right temperature and an even temperature throughout the whole oven. When I go to roll out these cookies, I actually do it in between 2 sheets of nonstick plastic wrap. I never touch the dough which I think helps to keep it chilled. I dump the dough straight from the stand mixer bowl onto one sheet of plastic wrap and knead it into a ball using the plastic wrap to press it together. Once it’s in a ball, I put one more sheet of plastic wrap on top and then roll out a thick dough. I like the dough to be quite thick for thicker and puffier cookies. I aim for 1/2 inch thickness. Press a cookie cutter into the cookie dough and use the plastic wrap to push up the cookie and transfer it to a baking sheet lined with a nonstick liner. I bake the cookies for 12 minutes almost to a tee. However, baking time will vary greatly depending on your oven, the thickness of your cookies, and the size of your cookies. You do not want to over-bake these!! I would start by setting a timer at 10 minutes and checking every 1-2 minutes after that. You know they are done when the very edges are barely browned on the bottom – the top should not be brown at all. Once the cookies have been removed from the oven, I immediately transfer them to a cooling rack for about 2 minutes. Right after the 2 minutes, I put the cookies (single layered or separated with wax paper otherwise they stick) in a large re-sealable plastic bag. I seal the bag to keep in the moisture and keep the cookies ultra soft. I’ve been determined to have a delicious frosting that is not sickly sweet and doesn’t call for loads of shortening in the recipe. My favorite frostings I’ve ever had always call for cream cheese, so I started there. Using just cream cheese wasn’t the results I was looking for so after adding some butter, it got to the creaminess level I was looking for. There are still loads of powdered sugar, but it’s not a sickly sweet frosting in my opinion. The Mexican vanilla and orange extract really heighten the flavor of the frosting and give it a different fresher taste than most frostings. I absolutely love the frosting with these two additions and highly recommend them. 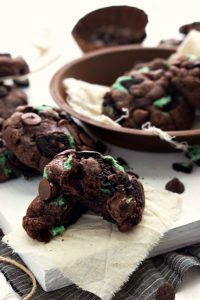 I know it is a TON of text, but if you are looking for the best results, please read the post thoroughly, That will tell you the exact ingredients and method I use to make these cookies. Cut the VERY cold (right out of fridge) butter with a knife into 1-inch cubes. Place in the stand mixer with the sugar. Beat until completely creamy and "light + fluffy". Add in the egg, Mexican vanilla extract, almond extract, and orange extract. Beat until completely combined. Add in the cornstarch, baking powder, and 1 cup of flour. Beat until completely combined scraping the edges as needed. Add in the next cup and beat until a dough forms. Add in the final 3/4 cup adding an additional 1/4 cup as needed for a dough that is firm enough to be cut out into shapes (or a circle). If the dough looks crumbly, keep beating until a dough does form (it will form even though it looks like straight crumbles!!) and if needed knead it with your hands. Just be careful to not overwork the dough as that leads to tough cookies. In between two sheets of plastic wrap, roll out the dough to about 1/2" thickness. Cut out the cookies and place on a parchment or silicone lined tray. Bake for 12-14 minutes watching carefully for when they slightly brown at the edges/bottom. Be careful to not overbake - the center should still look soft and not be brown at all. Under-baking slightly is huge for the flavor and texture of these cookies. Allow to cool on a cooling rack for about 2 minutes. Then place the cookies in a single layer (or separated with wax paper) in a large re-sealable bag. Seal the bag to keep the moisture in and the cookies ultra soft. Remove when cooled and ready to frost. In a stand mixer fitted with a whisk attachment, beat the room temperature cream cheese and softened (NOT melted) butter until completely combined and creamy. Add in the extracts. Beat in the powdered sugar a cup at a time until well combined. I usually use around 6 cups, but it varies. Add until the frosting is to your desired thickness. Thin the frosting as desired by slowly adding in heavy cream. 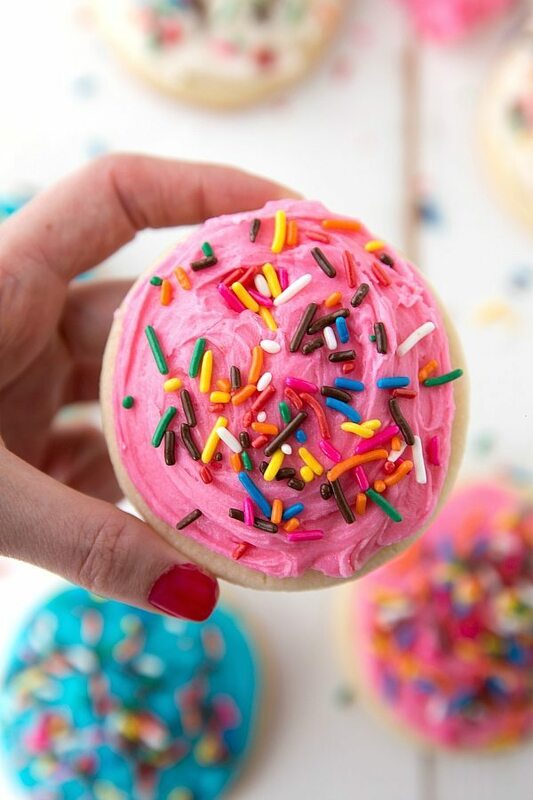 Frost the cookies (this recipe allows for a very generous amount of frosting) and top with sprinkles. Easiest half-batch chocolate chip cookies – no mixer and one bowl! 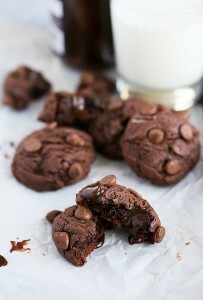 Triple-Chocolate Hot Fudge Brownie Cookies made with real hot fudge! 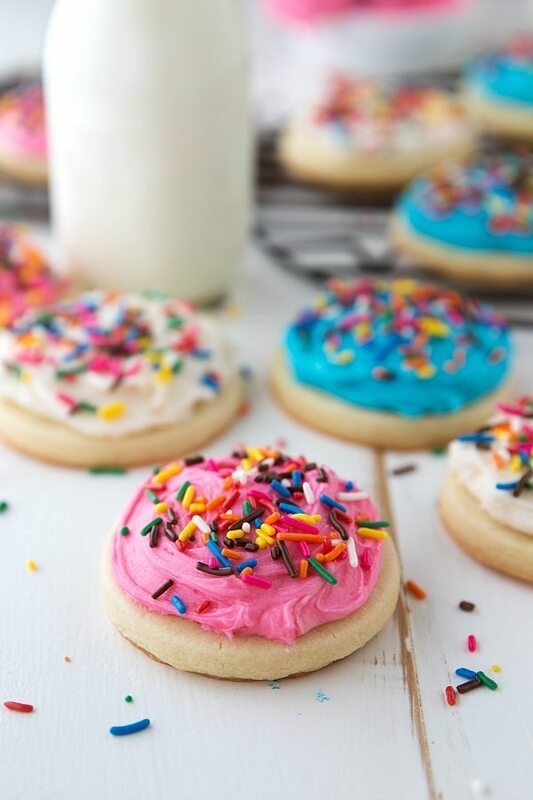 I love the classic sugar cookie! Although I don’t think I’ve made any since last Thanksgiving! For shame! haha These look fantastic Chelsea! Happy weekend! Your secret ingredients make it look intriguing. I only like soft & chewy sugar cookies with no frosting. Have you tried using whole wheat flour in it or part of it whole wheat? Since Americans have so much illnesses due to refined foods of all kinds–my board certified Dr newsletters encourage the whole wheat and whole grains and saying no refined sugars or flours in baking, etc. I have been using no white flour except in my streusel coffee cake. I’ll try this recipe & omit the frosting. My daughter has been doing great in giving healthy food to her 2 yr old Natalie. Natalie wanted Mom’s Cobb Salad at a restaurant over the pizza her Mom ordered for her. I’ve liked several of your main dish recipes. Thank you for sharing. Hi Judy! Thanks so much for your comment! Glad to hear you’ve enjoyed some of my recipes 🙂 And so happy to hear your daughter and granddaughter are so healthy 🙂 I actually haven’t ever tried whole wheat flour in these cookies. You could try it, but I don’t think they will be the soft and chewy cookie you are looking for. Whole wheat flour has a tendency to change the texture and even the flavor a bit (more nutty/earthy) when used in baked goods. White whole wheat flour may be a little better (it’s still whole wheat but isn’t bleached and tends to have a flavor closer to whole wheat). Hope that is helpful. You’ll have to let me know if you end up trying it out! These cookies look so soft and perfect, Chelsea! I love all your tips and work you put into coming up with this recipe. They’re decorated beautifully and the orange extract sounds amazing! 2 years in the making? Wow, these must be good! I am always trying to find the best sugar cookie recipe, and I think I’ll need to try these when Christmas rolls around. They look so delicious and the frosting is beautiful 😀 I’ve never tried Mexican vanilla before. I wonder what it tastes like! You have convinced me I need to make some sugar cookies! Thanks for all the great tips! Thanks for doing all the dirty work for us! 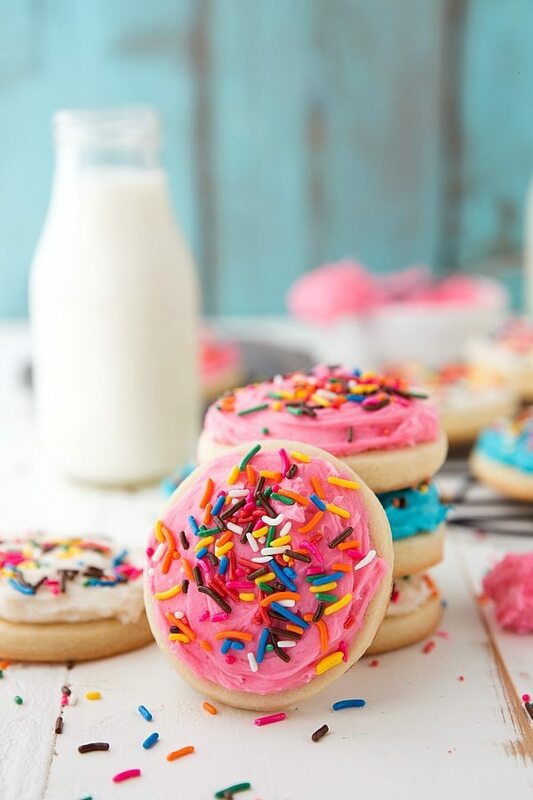 These cookies look epic! maybe I missing it but what do I preheat the oven to? I can’t find it anywhere! Sorry if I’m being dense! Thanks!!! Oh my gosh! So sorry I left that out of the actual instructions! It’s 350 degrees and the recipe has been updated. Thanks so much for bringing this to my attention! I left out the almond and orange extract, only because I don’t have them. Still these cookies look so good, they are cooling right now, and them I will frost them. Cornstarch?! Who’d have thought!! Thank you, also, for sharing a pic of the bottom of the cookies!! I often wonder how “done” they should look….. These look and sound amazing! I’m thinking of making these for cookie decorating at a pumpkin painting party in two days. How long will they keep once baked and put in the storage bags? Also, I don’t have vanilla sugar on hand (I’ve read that it takes 1-2 weeks for the flavor from the vanilla beans to come through in the sugar). Should I add some vanilla bean along with the extracts instead or just skip it and use regular sugar? Okay, wonderful! Thank you so much, I can’t wait to try these! Hi Chelsea! Can’t wait to try these! I make homemade granola and want to package it one day. I do think my ace in the hole is the vanilla I used (notice I say it past tense). I bought it while on a trip to Mexico. I ran out and tried to buy online and cannot buy it online. While searching for it, I found a lot of people were looking for it too and raved about it. Thought it might just be me. but I was wrong. Im going back to Mexico in April so I will stock up on it. What brand do you use? Great website btw! I’m on it because my niece made those amazing healthy pumpkin muffins for Halloween and I ate one the next day with my coffee and went crazy. I need a little sweet in the morning and they were just right. Thank you on your sweet compliments, I’m so glad you enjoyed the muffins! 🙂 Have a great weekend! I have these in the oven right now and can’t wait! Can I make the dough ahead of time, refrigerate it, and then bake the next day? SO excited for you! I hope you love them 🙂 Yes. I do that all the time! It gets pretty rock hard after being refrigerated overnight (wrap it really well with plastic wrap in the fridge), so leave it out about an hour at room temperature before you are ready to roll it out! This recipe sounds wonderful! However, I want a crisper cookie. 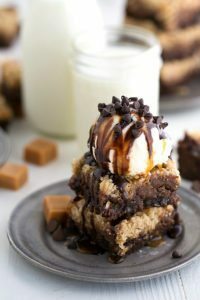 Is there a change I can make to the recipe that will enable me to make these cookies crisper? Thank you. Hey Donna! I would recommend omitting the cornstarch and then baking them for a bit longer. The longer they bake, the crispier they will become! What size cookie did you bake for 12 minutes? Also, can you decorate and use these for cookie pops? These look so good. If you can, could you share a recipe for frosting that gets hard? Thank you very much. Do the Sugar Cookies retain their shape when using detailed cut out cookie cutters. I have to make Longhorn (UT) cookies and want to make sure they will hold their shape and I can still decorate with a smooth (not royal) icing. 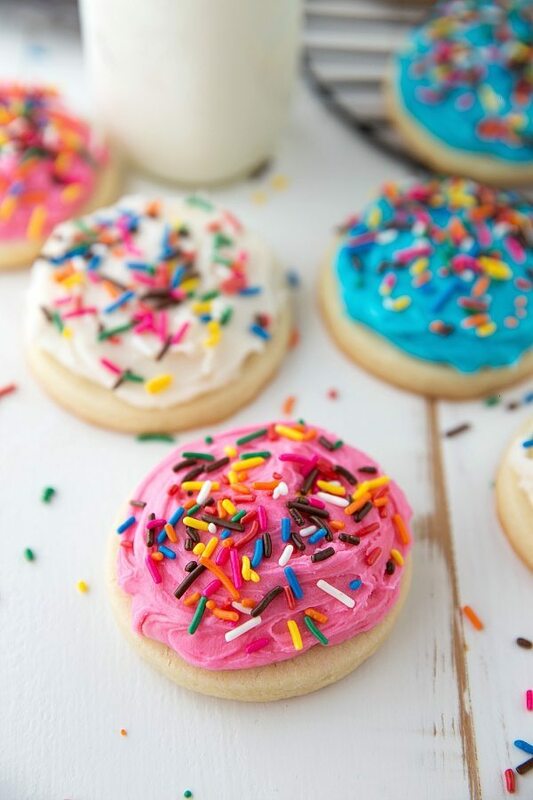 I’ve made these many times – this is now my go to recipe for sugar cookies 🙂 The flavor is amazing and they keep their shape perfectly. They’re always a hit! Thank you so much for making this recipe! YAY!!!! I have NEVER EVER made cookies from scratch and I am so glad your recipe was the first one I decided to try. I DON’T NEED TO GO TO ANOTHER RECIPE THIS IS IT!! THANK YOU!!!! Thank you so much for sharing!! I made the cookies and let them sit covered over night and today I will decorate them. I will make some of your frosting today and decorate some with my 3 year old. But I want to try to make a frosting that I can flood the cookie with … do you have any suggestions on making the icing runny enough to flood? I found one online that is just powder sugar and egg whites but I wonder if this will be too sweet. Oh guru, what your thoughts are here?! WAHOO!! I’m so thrilled these were a huge hit! 🙂 Thank you so much for the comment Amanda! 🙂 Okay so I have tried SO many royal icing recipes and hands down this one is my favorite: http://www.foodnetwork.com/recipes/alton-brown/royal-icing-recipe.html it is just egg whites, powdered sugar, and vanilla. 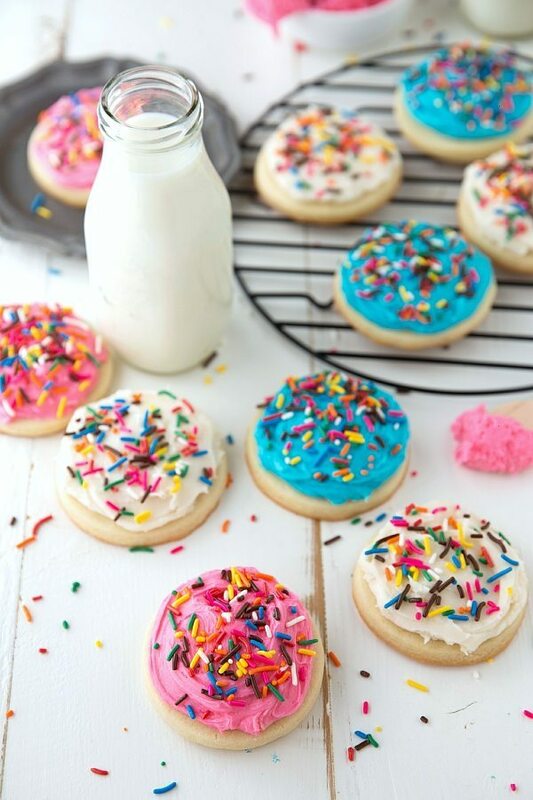 It is sweet, but it really works well with sugar cookies! Hope that helps. Am making these today with a couple of adjustments. Excited to see how they turn out. Thanks for all your work on your recipe. I added orange zest (1 Tbs) instead of orange extract, so we’ll see. Dough favor is great! I added 3 cups of flour total as the dough seemed sticky with just 2 3/4 C.
Given the time required for completing the dough part, I had to put into the fridge when my baby woke up, so I’ll have to see how the rolling, cutting and baking turns out. I am making these for next Saturday, so I’ll freeze baked cookies until the the night before. Wonderful! I’m excited to hear how they turn out for you 🙂 The zest sounds delicious — definitely trying that sometime! Hi Leslie! Thanks for the feedback! Have you tried rolling in between plastic wrap? That is generally what I use and I love it! Did you have to chill because it got too warm rolling it out? I tried your recipe a year ago and have been a fan ever since . Made these a dozen times over following your recipe to the tee and they have never failed.. thanks so much for sharing ! !